It’s not just the thrills racing up and down Chris Matthews’ leg. Writing in Thursday’s Investor’s Business Daily, author William Tate documents that campaign donations from employees of big media companies are tilting 100-to-1 in favor of the Democrats so far this election cycle. 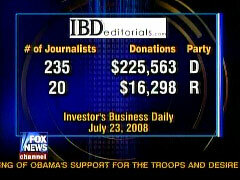 An analysis of federal records shows that the amount of money journalists contributed so far this election cycle favors Democrats by a 15:1 ratio over Republicans, with $225,563 going to Democrats, only $16,298 to Republicans. Because most news organizations ban contributions to political candidates, Tate warns, the numbers he presents are perhaps just the tip of the iceberg. But it’s just another indication of how the media elite are at odds with mainstream America.